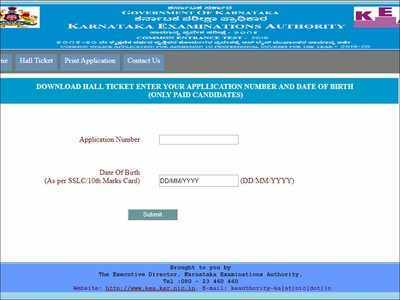 NEW DELHI: The Karnataka Examination Authority (KEA) has released Admit Card for the Common Entrance Test 2019. Through the Common Entrance Test, on merit basis, the admission is granted to the selected candidates to the First year or First semester of full time courses for Government share of seats in Engineering, Technology, B.Pharma, 2nd year B.Pharma, Pharma-D, Agriculture courses (Farm Science) and Veterinary courses, in Government / University / Private Aided / Private Un-Aided Professional Educational Institutions in the State of Karnataka for the academic year 2019-20 as per the seat matrix to be notified by Government. The KCET exam will be conducted on April 29, 2019 and April 30, 2019 in two shifts. KEA has reschedule the exam date to avoid clash with Lok Sabha election 2019.